This yew can reach 20 feet high in 20 years and while it is narrow when young, it grows wider with age. 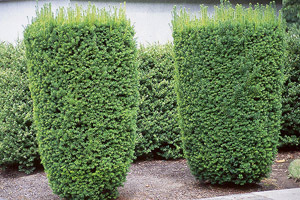 Both male and female columnar clones produce deep dark green needles on top and pale green underneath. In general, form is broadly pyramidal with a central leader. Similar to Taxus cuspidata, the Anglojap Yew has olive green branchlets which do not turn brown the second year. Bud scales are blunt and leaves are two-ranked. Thrives in sandier soil that is acid to neutral and well-drained. Does well in either sun or shade. Width: 20 ft. to 30 ft.